When we wish to weaken an elements qualities, we use the weakening sequence. 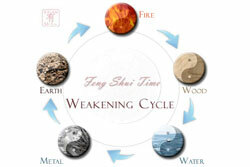 In the five elements weakening cycle the elements exhaust or reduces each other as shown in the diagram on the right. In this cycle, Wood is exhausted or weaken by Fire. Fire in turn is weakened by Earth which in turn is weakened by Metal. Metal is weakened by water. Finally Water is weakened by Wood and the whole cycle starts again. It is the opposite of the productive cycle and is the hardest to remember. The principle behind the five element weakening cycle is the fact that when an element produce another e.g. wood produce fire, the producing element in this case Wood is exhausted in the process. The best way to remember the weakening cycle is remember it as the opposite of the productive cycle. For example Earth produce Metal. When metal ore is removed from the ground, Earth is exhausted!